On Sunday-10-November- 1918 the Trinity Lutheran Church in Bogota held its first Worship Service. This was lead by Reverend F.P.Wilhelm of the Atlantic District of the Lutheran Church , Missouri Synod. The Service was held at Central Ave Firehouse. It is reported it was attended by 43 People. Trinities first Pastor in Residence was Daniel Kleist and was installed on 9-September -1919. Groundbreaking for the Current building was started on 15-March-1920. 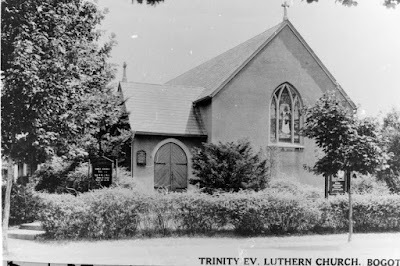 Trinity Lutheran Church is located at 167 Palisades Ave Bogota, NJ.